A Twin room which shares a coridor with direct access to the central pend at the hotel. Ideal accomodation for families traveling together. 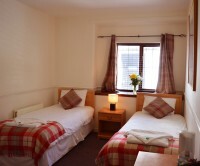 This room have full ensuite facilities with showers and baths. There is ample space to relax and enjoy your stay. A lovely base to explore the surrounding Angus countryside and glens.